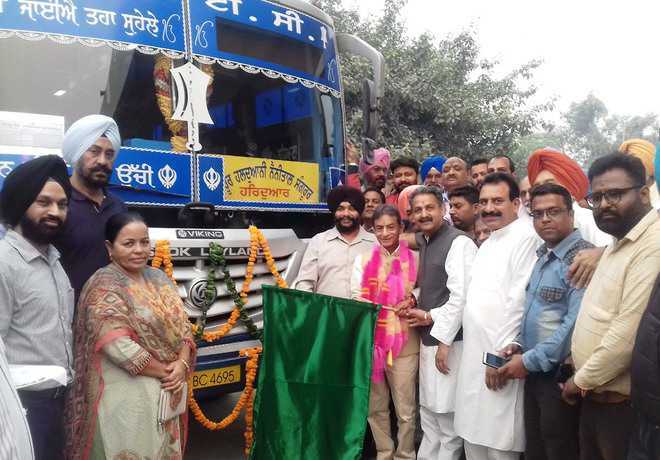 Punjab Cabinet minister Vijay Inder Singla on Thursday flagged off four buses on different long routes from Sangrur. Singla, who is an MLA from Sangrur, said more buses would be started as per the demand of area residents. “Today we have started buses from Sangrur to Nainital, Jaipur, New Delhi and Amritsar. Chairman of the PRTC has also accepted our demand of starting a bus to Ajmer Sharif and Salarsar in Rajasthan and these will also be started soon,” said Singla. Chairman of the PRTC KK Sharma and Managing Director Manjit Singh Narang were also present. Singla said the Punjab government had started a new project under the name of “saving card” for passengers of the state, which would enable them to save money. “Anyone travelling in an AC bus from Sangrur to Amritsar purchases tickets for both sides by paying Rs 670, but under the new saving card scheme, he will have to pay Rs 540,” said Singla.